Synesthesia: How does your name taste? Are you convinced that Mount Everest tastes like strawberries? Or that Friday is a deep green colour? Does hearing your friend Dave’s name make you wretch? If so, you might be entering the baffling world of synesthesia. Synesthesia (synaesthesia in British English) is a neurological condition whereby one’s senses literally merge. It means ‘joined perception’ and can cause names to have a particular taste, letters to have a particular colour and a whole host of other sensory fusions. It may sound more like a psychedelic experience in a drug-induced haze but this is a sober reality for a number of people. Some of the most famous creative types of our times have been diagnosed or suspected to have synesthesia. Marilyn Monroe was described by the biographer Norman Mailer to have a “displacement of the senses which others take drugs to find… she is like a lover of rock who sees vibrations when she hears sounds”. Stevie Wonder reportedly has sound-colour synesthesia whereby even though he is blind, he ‘sees’ the colour of the music. This added sensation is not restricted solely to arty types, however. Richard Feynman, the excellent Nobel Prize winning physicist, claimed “When I see equations, I see the letters in colours”, before quipping, “I wonder what the hell it must look like to the students”. Estimates put the number of synesthetes at between 1 in 200 and 1 in 100,000 (which basically means we really don’t know how many people experience synesthesia). Some even claim it could be as high as 1 in 23! If any of this sounds familiar to you, you can test whether you may have synesthesia here. There is a lot of fascination from scientists into this condition. The organisation of the senses is seen to play a major role in formation of memories. When you form a memory of a person, you link the information from multiple senses. The sound of their voice, the colour of their hair, the letters of their name all form your memory of that person. But for most of us, these senses still exist as separate aspects of our memory of that person. You don’t intrinsically link the letters of their name to their hair colour. Synesthetes have secondary sensory experiences that are completely involuntary. Some synesthetes say that the colour of someone’s name is actually how they remember them. They may remember the name Dave by the colour orange more than the letters of the name. This is where the science behind it all comes in. Sensory information should be contained separately but able to be integrated at will. Different sensory information is processed in largely the same way but in distinct sensory regions. 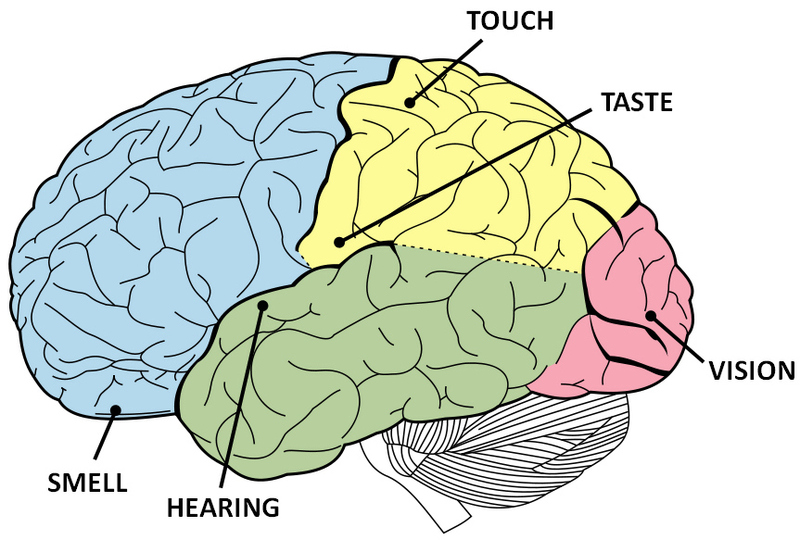 You can see below the various parts of the brain that are responsible for the different senses. As you can see they are spatially separate. The beauty of the brain is connecting this information as and when it is needed. What appears to be the case in synesthetes is that these sensory regions are intrinsically connected. For example, sound-colour synesthetes seem to have more activity in colour-processing regions of their visual cortex (known as area V4) while listening to sounds. Instead of distinct pathways being linked at will, it could be the case that these two systems are bound together and stimulation of one sense also activates another. It is interesting to be able to see these differences in the brains of synesthetes. What is not very clear, however, is why synesthesia is around at all. 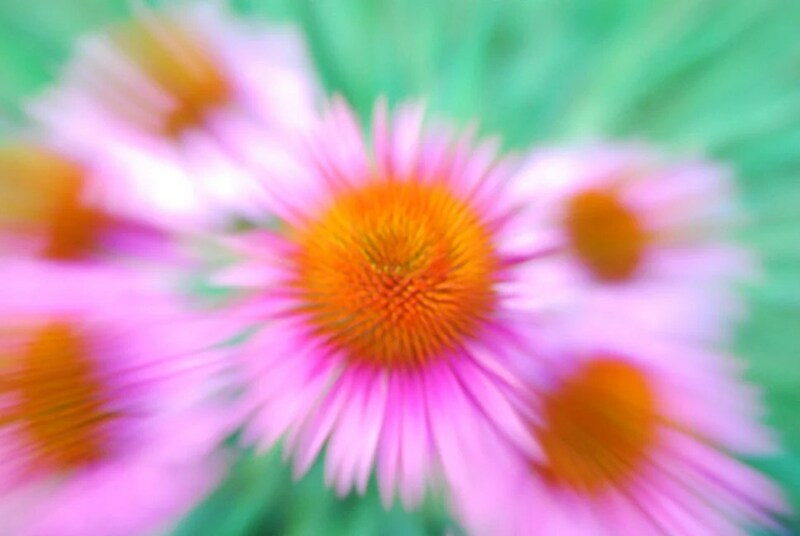 Does having synesthesia benefit you in any way? It appears that actually it might. Synesthetes have been known to be better at remembering phone numbers, for example, suggesting they may have better memories. Letter-colour synesthetes have also shown they can be better at discriminating between different colours, whilst hearing-motion synesthetes are better at visual tasks. So could this be a rise of the superhumans – an evolutionary advantage to be able to process more sensory information than the rest of us? Further research into synesthesia will not be a purely academic exercise but will contribute further to our understanding of the human brain. How the brain links information together on request is one of the major mysteries of neuroscience, a point focused on in Obama’s BRAIN initiative. As synesthetes show remarkable differences in how they integrate information, it will be fascinating to see whether they can be the valuable subjects to advance our knowledge of the brain. Nerve regeneration: do good things come in small packages? whats my name colors??? by the way my is DENISE!!!! there is no absolute color attached to your name. the above described-as far as I get it – means that some people might assoziate your name with one or more colors. it depens on who you ask. and I guess as well as on the circumstances the name appears in. i really don’t know if i’m one of those synesthetes, but to me, the name “denise” (written down in this explicit font, on white underground and in the context of how you phrased that question (ergo a surface impression of your character)) appears to be something orange or yellow with a spark (?) of green. PLEASE ANSWER THIS!!! Can you get synesthesia without being born with it???? BECAUSE I EXTREMELY WANT IT!!! I find this interesting, as a child words always seemed to have a connection to a certain taste flavor or food to me. Names more so than anything. And I also have always had an emotional response to peoples voices. A certain tone or pitch can shut me down or make me more interested. Not on the person or what they are saying. Just the sound of their voice. Im very partial to names that start with D. Most of my past boyfriends where D’s. But my 2 most serious relationships were A’s, I married one of the A’s. my favorite Nephews Name also starts with an A.
I dont have that association with numbers or days of the week or calendars. I dont see any cool word tickers or colors. I think many people have a form of this they just dont think to mention it to anyone. You may think everyone is that way. Im in my early 30s now. Its not as strong as it was when I was a child. But still pops up on occasion. OMG! I want synesthisa sooo bad! what color is my name? P.S. I love ‘A Mango Colored Space’ as well!!! P.P.S. That book is how I found out that some people could see those colors for real! Bridget, your name is a pale yellow with hints of orange near the I and the e is a bit green. Your name for me is in shades of deep orange/coral, with each letter having dimension with a bit of dark background, and with a bit of movement within the 7 letters. Hi, I’m not sure if I have Synesthesia. I associate letters with colors, so for example, if I think of the letter “A”, it is light blue in my head. The only problem is that unlike the girl in A Mango Shaped Space, the colors don’t distract me or make me bad at math. In fact, math is my favorite subject. Also, my colors sometimes change. For example, if I saw the word “banana” before I knew what it meant, it would probably have been dark green-ish, because of the B. Since I do know what “banana” means, I see it as yellow. Do I still have Synesthesia? Bright red. The two A’s in your name are bright red, the m is rusty red, and the d is purple if you were to break the word down into letters, but the name as a whole is bright red like the two A’s. My friend and I are studying Synaesthesia at Univeristy and are finding it so incredibly fascinating! Would anyone with synaesthesia be able to tell us what our names taste like? Maddie and Jessica. Also does the taste of Jessica vary to the taste of Jess? Can I?! Can I?! What does my name taste like?? Or which colour do you see? My name’s Gabriela, does it change in any way if its just Gabbie? Colors associated with names or words or letters are not fixed and will vary from person to person. Also, not all people have all types of synthesia, so not all synesthetes associate colors with names. I wish I had this! It sounds so interesting. Hey there! My name is Hena. Hena Akhter. Can I know what my name is colored as and what’s my name taste like? hey my name is Carolina and my sister is Ana can you tell me please please please what our names are colored?? and how do they taste like?? please please please!!!! My name is Vivian. Can you tell me what my name tastes, or what color it is ?thank u.